Carter,T., Hulme,M. and Viner,D. (eds.) (1999) Representing uncertainty in climate change scenarios and impact studies Proceedings of the ECLAT-2 Helsinki Workshop, 14-16 April 1999, Climatic Research Unit, UEA, Norwich, UK, 128pp. Doherty,R.M., Hulme,M. and Jones,C.G. (1999) A gridded reconstruction of land and ocean precipitation for the extended Tropics from 1974-1994 Int. J. Climatol. 19, 119-142. Hulme,M. (1999) Global warming Progress in Physical Geography 23, 283-291. Hulme,M. (1999) Future climates of the UK: the UKCIP98 climate change scenarios Town & Country Planning 68, 12-13. Hulme,M., Barrow,E.M., Arnell,N., Harrison,P.A., T.E.Downing and T.C.Johns (1999) Relative impacts of human-induced climate change and internal climate variability Nature 397, 688-691. Hulme,M., Harrison,P.A. and Arnell,N.W. (1999) Climate variabiltiy and crop yields in Europe: reply to Porter,J.R. and Semenov,M.A. Nature, 400, 724. Hulme,M. 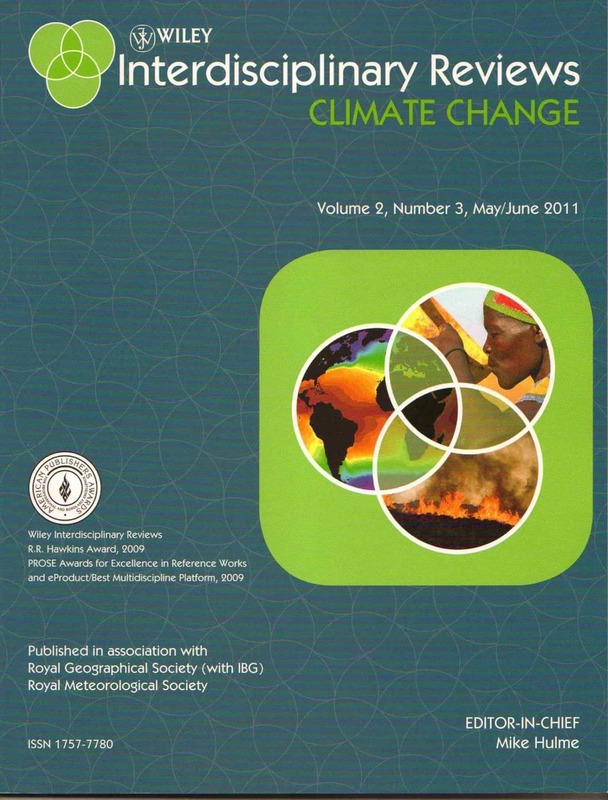 (1999) Climate change pp.406-436 in, The changing geography of the UK (eds.) Gardiner,V. and Matthews,H., Routledge, London, UK, 528pp. Hulme,M. and Carter,T.R. (1999) Representing uncertainty in climate change scenarios and impact studies pp.11-37 in, Representing uncertainty in climate change scenarios and impact studies Proceedings of the ECLAT-2 Helsinki Workshop, 14-16 April, 1999 (eds.) Carter,T.R., Hulme,M. and Viner,D., Climatic Research Unit, Norwich, UK, 128pp. Hulme,M. and Carter,T.R. (1999) The changing climate of Europe Chapter 3 in, An assessment of the potential effects of climate change in Europe (ed.) Parry,M.L., The report of the ACACIA Project, UEA, Norwich, UK, 350pp. Hulme,M., Mitchell,J.F.B., Ingram,W., Johns,T.C., Lowe,J.A., New,M.G. and Viner,D. (1999) Climate change scenarios for global impact studies Gobal Environmental Change, 9, S3-S19. Jones,P.D., Horton,E.B., Folland,C.K., Hulme,M., Parker,D.E. and Basnett,T.A. (1999) The use of indices to identify change in climatic extremes Climatic Change 42, 131-149. Mitchell,T. and Hulme,M. (1999) Predicting regional climate change: living with uncertainty Prog. in Phys. Geogr. 23, 57-78. New,M., Hulme,M. and Jones,P.D. (1999) Representing twentieth century space-time climate variability. Part 1: development of a 1961-90 mean monthly terrestrial climatology Journal of Climate 12, 829-856. Osborn,T.J., Conway,D., Hulme,M., Gregory,J.M. and Jones,P.D. (1999) Air flow influences on local climate: observed and simulated mean relationships for the UK Climate Research 13, 171-191. Parry,M.L., Arnell,N.W., Hulme,M., Martens,P., Nicholls,R.J. and White,A. (1999) The global impact of climate change: a new assessment Global Environmental Change 9, S1-S2.